Lo and behold! The first post is dedicated to probably the tastiest cake ever to venture into my mouth. 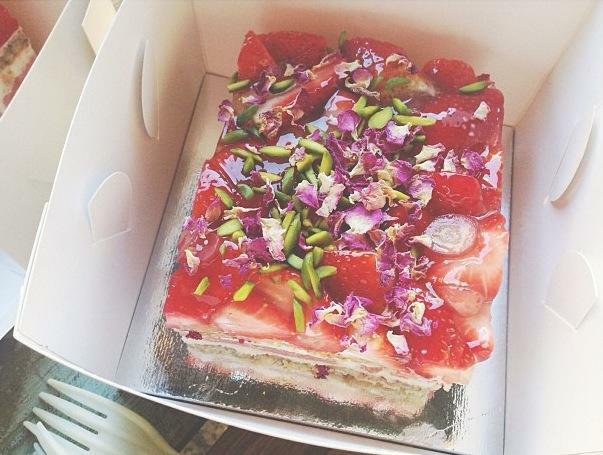 You can't refuse the Strawberry Watermelon and Rose cream cake... even if it costs $7.50 for a small piece. It is definitely worth the 45 minute commute from my hometown. The tiny innards of the cafe? bakery? holds a barista with shelves encasing with delectable pastries and sweets. I hear the lamb shank pie and the lamb shake pie & beer brisket pie are quite the popular studs as well - but nonetheless, the Strawberry watermelon cake steals the show! It's a funny story actually, I brought some cake home for my mum to try and she was very critical of the cake haha (we own an Asian bakery). Her view of the cake was that there was hardly any cake but an abundance of cream and fruit, she was also surprised by the (edible) rose petals. There's probably only one layer of actual 'softness' that deems it as a cake. Who knew dried rose petals tasted so good? The cake is super light to eat, it isn't heavy on the sweetness but the fact that it is predominantly rose cream and fruit probably holds the reason why. If you're not a cake lover, you're this cake's lover. Best to avoid the weekend rush, people would line up just to savour the deliciousness of this cake i.e. me. P.s. Has anyone tasted the vegan chocolate, lime, avocado cake from there? I've been twice but I've never seen it on display. So sad. It looks yummy!